We have partners who are leaders in the industry of zone enclosures, to provide telecommunications spaces outside of the traditional telecommunications room. Standards-recognized zone cabling practices create consolidation points to reduce the overall cost of adding or moving network cabling. These products can attach to the wall or be installed above drop ceilings or under access floors. Zone enclosures let you pre-wire a work area so that connections to the rest of the network are close to network users. Zone enclosures make connection changes within the zone easier and less disruptive because only the cables within a zone are moved, added or changed. Zone Enclosures include consolidation point enclosures and telecommunications enclosures that fit under a raised access floor or within a drop ceiling. We also offer Multi-User Telecommunications Outlet Assembly (MUTOA) floor boxes for the work area. Wireless enclosures secure access points close to network users. Access points create Wireless LANs that connect wireless network users with radio signals, eliminating the need to connect users with cables. Wireless enclosures protect access points and secure network connections. 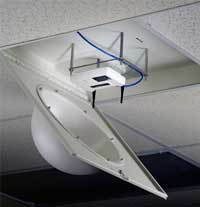 We also offer several styles of wall-mount and drop ceiling Wireless Enclosures including several NEMA-rated models that can be used in warehouses, industrial environments and outdoors.